Last weekend Dave and I took the kids to pick strawberries. I love doing this type of thing with the kids because it reinforces the idea that eating plants is interesting and fun. They will be four years old in September, so they are old enough to legitimately help pick… or at least not stop us from picking once they get tired. Luckily for us, we live close to a lot of u-pick farms. Last year we picked $50 worth of raspberries. At first I thought wed gone overboard but when I was still putting frozen raspberries in my smoothies in January, I was glad wed picked so many. 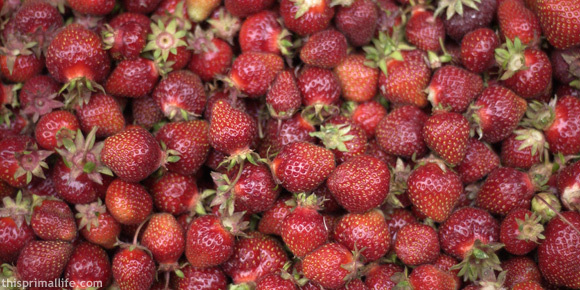 So today we picked 20 pounds of strawberries. We’ll gorge on them for a few days and then Ill freeze the rest. Now on to the pie. Im going to be straight with you. I dont normally do things like whip up a new pie recipe on a Sunday morning for the family. In fact, I dont normally make pies at all. Baking is not really my thing. However, since starting to eat primal I have been experimenting more with baking. About half the time I end up making something that, to put it gently, I would not feel comfortable sharing with someone outside my immediate family. So, I was nearly overjoyed at the results of this experiment. This pie was pretty darned good and after I told the kids that I wasnt sure they could have any because normally this kind of pie is for grownups only, they really dug in! As a bonus, you can serve this to non-primal folks, even ones you dont know really well, and not look like a weirdo. By the way, I highly recommend eating this pie for breakfast! Mix almond flour, butter, salt and cinnamon in a bowl. Press mixture into a pie plate to form the pie crust. Mix bananas, lemon juice, and vanilla extract either in a food processor or by hand (youll need to mash the bananas first if you mix by hand. Then gently mix in coconut milk and eggs. Pour banana filling into pie crust. Bake at 350 degrees for 35 minutes, or until set in center. Let pie cool. Top with sliced strawberries (I did a sort of spiral-towards-the-center thing and sprinkle with flaked, unsweetened coconut, if desired. Made this pie this wknd.. was very tasty!! Glad you liked it. I’ve made it several times now. My kids (and I) love eating ‘pie’ for breakfast! I have some ripe bananas to use up. 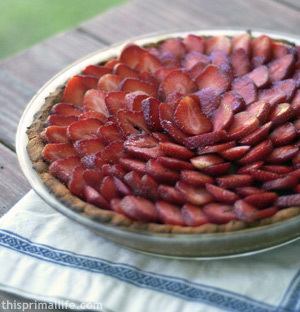 Will definitely try them on this tart! It looks delicious. Love that there’s no added sweetener. Good to see you on Tastespotting! I am so happy I found this site! You are a blessing. 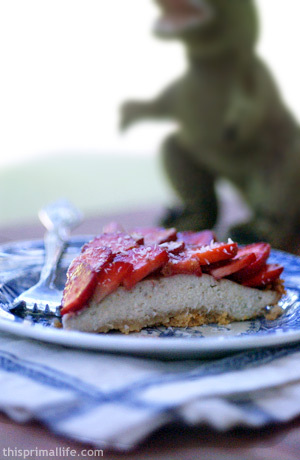 My mom and I made your Primal Strawberry-Banana Pie this morning and it was wonderful! Thanks for the ideas. We are trying the Summer Squash Fritters tonight. This is amazing! Today is my third time making it. The first two times is was gone within 24 hours – my family devoured it. I don’t have strawberries today so I’m using a variety of other fruits instead. Thanks for the recipe! Hi Shelly, I just made this and loved the pie! I made a couple boo-boo’s but will know for next time to ensure that the bananas are quite ripe to sweeten the pie a bit, other than that my wife and I loved it and look forward to eating it for breakfast. I am sure my kids will love it. I finally made this last night, and it’s a winner! I love the lack of any added sweetener. Thanks for the great recipe, I will definitely be making this again. Does this taste like coconut? I am not a fan of coconut, but could substitute with perhaps heavy whipping cream? Can I substitute oil for the butter in the crust? I don’t eat dairy, but this recipe looks so good! Just taken it out of the oven and it smells (and tastes, well I couldn’t resist 😉 ) fantastic. Just cooling now, before I put the strawbs on. Mmmm, this looks fantastic! I’ll have to remember to come back to it once our garden starts putting out strawberries again in the spring! Loved this recipe. Tried it after it cooled to room temperature. Looking forward to trying it tomorrow after it’s chilled in the fridge over night. Will only add 1/2 tsp salt to the crust next time. The recipe didn’t specify how much of a cup of unsalted butter to use. I used 1/4 cup and was fine. Should I have used less? I can’t see the amount for the melted butter. Can anyone tell me what the correct amount is?